This modern room with balcony features an electric kettle, a Mini-Bar, a flat-screen TV and a safe. The private bathroom includes a hairdryer and free toiletries. Free Wi-Fi. This larger elegant room with balcony features an electric kettle, a Mini-Bar, a flat-screen TV and a safe. 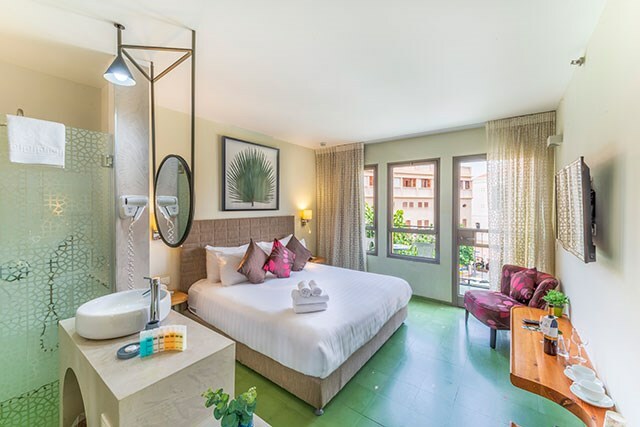 This room offer a large balcony and a special seating area inside the room, this modern junior suite features an electric kettle, an Espresso Machine, a Mini-Bar, a flat-screen TV and a safe. The private bathroom includes a double shower or spa bath, together with a hairdryer and free toiletries. Free Wi-Fi. This room offer a big balcony with a view to the famous Margosa Street. Modern Suite (one large room) features an electric kettle, Espresso Machine, a Mini-Bar, a flat-screen TV and a safe. The private bathroom includes a hairdryer, two toiletries and Kitchenette. In addition there is a free standing style bath tab. Free Wi-Fi. This large family room is divided into two separated spaces: one is with Double Bed and in the other an open Sofa. The room features a wooden floor, electric kettle and private entrance, a private bath room with a shower, Kitchen and living room. For the safety of the children, this room don't have a balcony. Free Wi-Fi. This single room features a balcony with a special landmark view, wooden floor, an electric kettle, a Mini-Bar, a flat-screen TV and a safe. The private bathroom includes a hairdryer, free toiletries and Kitchenette. Free Wi-Fi.